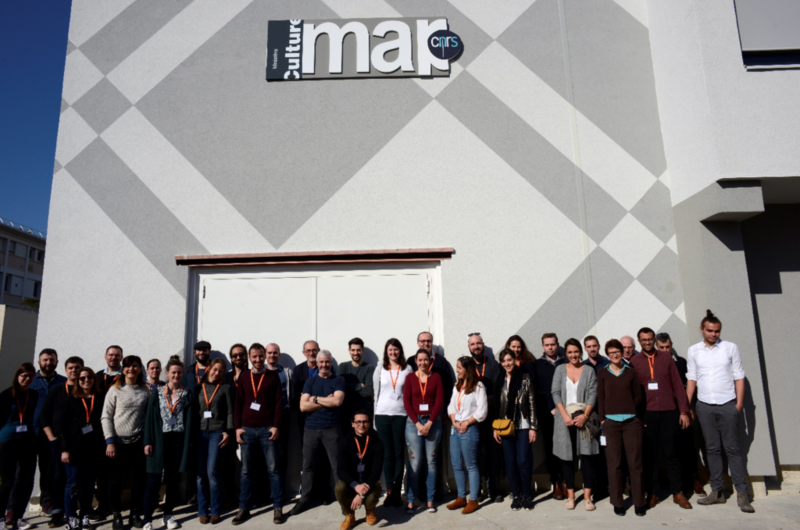 From 25th to 27th February 2019, the MAP (CNRS) hosted a three day workshop in Marseilles (download the programme), aimed at exploring specific tools designed to meet issues related to the use of 3D in Humanities. The workshop, jointly organised by 3 members of PARTHENOS (CNR, CNRS and Inria) with the support of Huma-Num’s 3D consortium for Humanities and the CNRS-MAP/CNR-ISTI International Joint Lab, was attended by 16 selected participants from 15 institutions in 9 countries with various profiles: archaeologists, architects, computer scientists, geomaticians, photographers, curators. Indeed, whilst 3D technologies have developed rapidly over the last ten years and are fast becoming part of their tool kit, researchers are still facing some issues. Through presentations and training sessions, the participants explored specific tools developed by the organizers’teams which deal with these issues. The workshop enabled to confront practices within different communities of the Humanities and to raise for lively discussion, particularly of the potential improvements of the tools presented. During the training sessions, the participants delved individually into the tools with their own data but they also split into small groups to join efforts to define common methodologies and feed the Standardization Survival Kit with new research scenarios. new research scenarios that will be implemented in the Standardization Survival Kit. These outcomes will be part of the WP4 deliverables and the white paper will also be deposited in the open archive repository HAL. Publication is planned for April 2019. Finally, the master classes sessions had been recorded and would be soon available in the PARTHENOS collection of Huma-Num’s channel’s of the Canal-U platform as well as on the PARTHENOS Youtube channel.